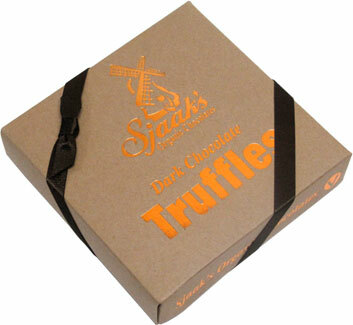 Perfect for giving, sharing, or even enjoying all to yourself, this scrumptious organic dark chocolate vegan truffle assortment from Sjaaks gives you top-quality natural ingredients paired with awesome chocolate craftsmanship for plenty of indulgent flavor in every piece. Each one is a smooth, rich chocolate truffle center surrounded by a dark chocolate shell to make one of the finest vegan confections you'll experience. 6.25 oz. (182g) boxes are $11.99 each. Allergen Contains tree nuts (almonds, cashews, coconut, hazelnuts). Made on equipment that also processes peanuts.